Procreate 3 has been released last week. Several new features have been added, and it includes support for iPad Pro and Apple Pencil. Sadly, as with many app updates (and to my great annoyance), things that were working perfectly fine may occasionally stop working suddenly. And we users have no way to bring back an older version of our favourite apps. Pressure sensitivity for my Pogo Connect is a good example: it was working perfectly fine before the update, but in Procreate 3 (Build 70704bb) there’s an issue. But fret not, the team are aware of it and they’re working on a fix as we speak. After extensive testing and community input, I found a workaround that makes the Pogo Connect play nice again with Procreate 3. I’ve posted this solution in the Procreate Forums, but I thought I’d add it here too. Here’s what worked for me step by step. I’m using an iPad 3 with iOS 9.1, with two Pogo Connects (version 1 and version 2). 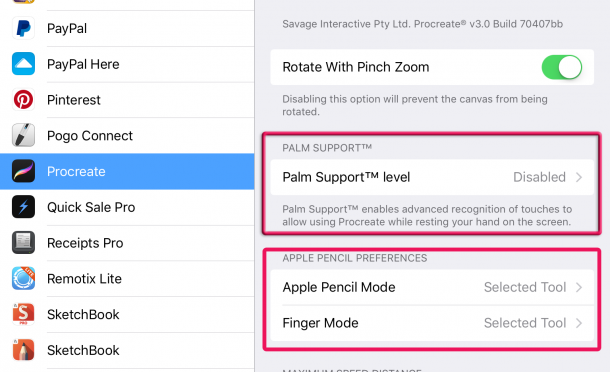 First, under iOS Settings – Procreate, the default values for Palm Support (TM) and Apple Pencil Preferences are working fine. However, due to a bug in iOS, we must change each value to something else, then back to the defaults. It’s a Preference Pane thing: when new default values are added, the values are displayed but not always read by iOS. Changing them forces iOS to read the new values (Developer note: new NSUserDefaults aren’t read from the Preference Pane’s PLIST when they’re new – I never understood why. Setting them manually in applicationDidFinishLaunching does the trick). 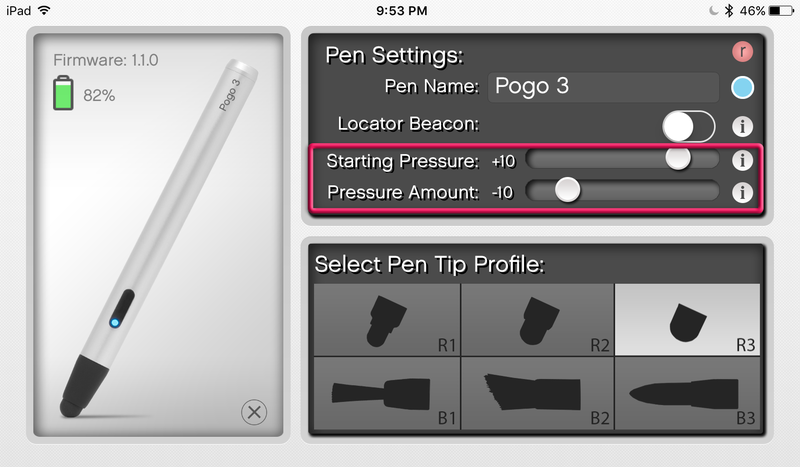 Next, Procreate 3 appears to digest the amount of pressure from the Pogo differently than previous versions. It requires a lot more pressure for strokes to register. Lucky for us there’s the Pogo Connect app from the App Store! With it we can adjust how the Pogo delivers pressure data to other apps (Pogo Connect with firmware 1.1.0 or higher is required, otherwise those values won’t be saved in your Pogo). Note that the Pogo App MUST NOT RUN while you’re running Procreate! The Pogo can only connect to a single app at a time, and it easily gets confused. So to set those values, quit Procreate and press the Pogo button (until it stops blinking blue). Now open the Pogo app, connect the pen and set those values. Disconnect the Pogo from the Pogo app (using that little X icon at the bottom right, where the pen and firmware settings are shown). Close the Pogo app, open Procreate, press the Pogo button to connect and see how it’s working out. If the Pogo is connected but no strokes appear on the canvas, or the strokes appear but no size/opacity variation seems to happen, quit to the Gallery and open your canvas again. 9 times out of 10 I had success with that method. The above will adjust pressure sensitivity for all your brushes, or rather, the way our Pogo delivers pressure data to Procreate. But you may have your favourite brushes too which may require individual tweaking just to your liking. 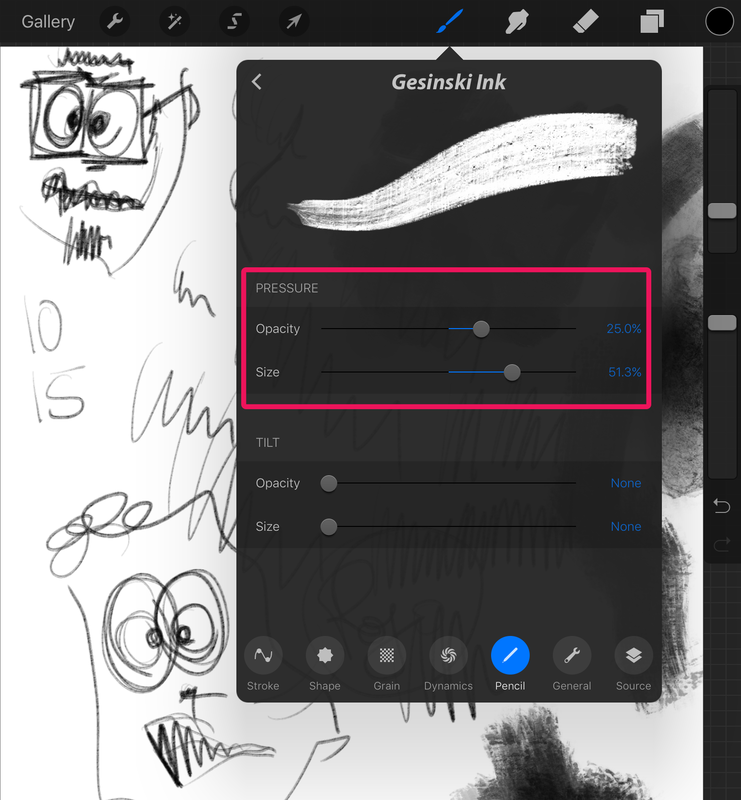 This setting has moved from Dynamics (Procreate 2.x) to Pencil – Pressure (Procreate 3). If you want the brush to react to a lighter touch, set the values lower. If you want it to react to more pressure, set the value higher. I seems to find simple solution to bring back pressure of Pogo on Procreate. Just remove all amother Apps connecting Pogo connect from active Apps history. Hi Taiyo, glad to hear that it worked for you. The team have pushed out an emergency fix a couple of days ago, and the Pogo Connect behaviour appears to be almost back to normal. Feel free to scale that added pressure sensitivity back that we’ve discussed above. At times the Pogo still appears to not deliver pressure data to the app at all. This issue is intermittent: out of a sudden you may lose pressure sensitivity, only to find it comes back again out of the blue. Only Procreate seems to have this problem, so I doubt that it’s related to the Pogo SDK. Should the issue strike, try heading back to the gallery and open your canvas again. If that doesn’t work, reboot your iPad (worked for me). Thank you so much for this post! I was feeling lost on this subject and your solution worked perfectly!